With the plethora of features available on the wide variety of irons, how do you know what is right for you? 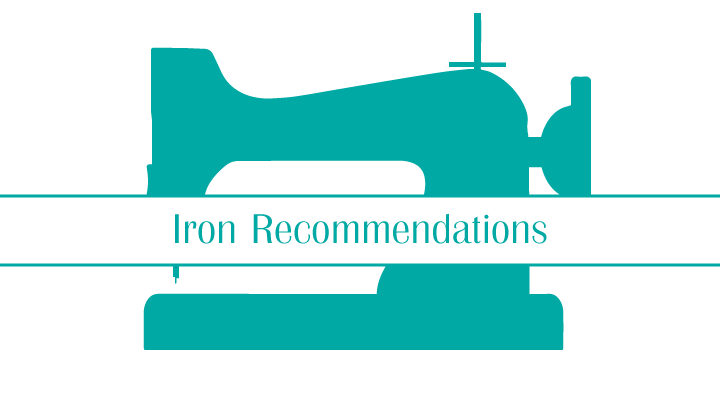 These iron recommendations are from individuals with a varying levels of sewing skills. They are people just like you. Use these iron recommendations as a starting point to find that perfect iron for you. As stated in a previous post, many baseline irons do not have auto-shutoff features. This feature may not be necessary if you always remember to turn off the iron. This is a baseline iron recommendation that is packed with power, but minimal features keeping the price on the lower end. This is my personal iron. I love it! It has a nice range of iron features without being a burden on the beginner’s budget. This 1400 Watt iron packs a punch when it heats up. It gets hot and gets hot quick. The automatic shutoff is a great energy saving feature as well as a great safety feature. Never burn your clothes again or worry about if you left the iron on when you left the house with the built-in 3 way auto shutoff feature. The large water tank is a nice feature considering this iron is a steam producing powerhouse. Many may think that I would naturally love this iron because it is teal (my favorite color), but I assure you that it is just a good looking that packs a lot of features in its pretty exterior. The fact that it is teal does in fact make me smile every time I use it. This is a great light weight iron that packs both power and features. I had an earlier model of this iron and enjoyed it almost as much as I do my current iron. This powerful iron features a digital display of settings, steam boost, large capacity water tank, and auto-shutoff among others. This is a heavier weight iron for those with a preference. This iron recommendation features a powerful wattage and features such as easy clean, auto-shutoff, and a large water tank. This iron recommendation is coveted by many quilters. It features auto-shutoff and high wattage. This iron features the itouch technology that automatically lifts the iron when you are not touching the iron and automatically lowers the iron when you touch it again. Next post: What is “handmade”?